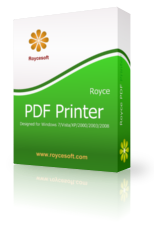 Royce PDF Printer enables you to create and optimize PDF output for its intended use. You can make PDF documents small for Web display or high resolution for printing with Royce PDF Printer's powerful Compression features. You can also embed fonts, if needed, in the PDF document to ensure correct document display. 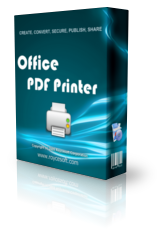 Office PDF Printer is the lightweight version of Royce PDF Printer, and it allows you to easily organize content from a variety of sources, such as spreadsheets, documents, e-mail, images, reports, and web pages, a single searchable PDF document for easy distribution. It helps to protect copyright and sensitive information, and improve print processes. Office PDF Server is an enterprise-wide electronic document management software solution, which simplifies PDF creation in one flexible and easy-to-maintain server-side process. The software offers everyone in your organization the ability to create and edit their PDF files on demand, at anytime. PDF files can be created from any printable Windows application and can be easily viewed and securely shared by anyone, internally or externally. 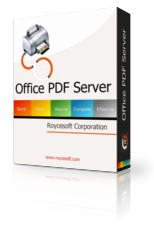 Office PDF Server se per is designed for multiple users and high volume conversions. As such, there are no limits, per server license, as to how many conversions can be achieved throughout the organization. Office PDF Server saves IT department time and effort by centralizing complete administrative control over how PDF documents are created within the organization. Thus, it dramatically simplifies the electronic document management process. The software can be deployed only once. Maintenance and updates are centralized. IT administrator has total control, such as to set permissions, specify the default document properties and security in accordance with the organization’s document retention policies.